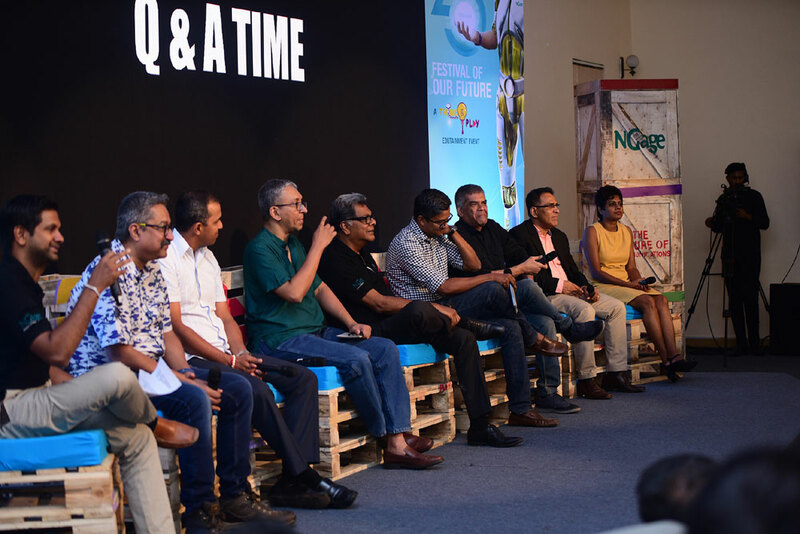 Bates Strategic Alliance, the pioneer in Integrated Marketing Communications and Public Relations, celebrated its 25th Anniversary with a well-curated ‘Festival of Our Future’ which explored vital issues and future trends in four critical areas – brands, communications, environment and society. The Thought Leadership Sessions which featured all of 32 eminent local and overseas speakers and two national leaders in a single day drew high praise from the invitee audience and the participating speakers. The morning sessions on ‘The Future of Brands’ and ‘The Future of Communications’ explored the changes in technology, society and the operating environment and the implications for brands and communications of the future. Bates Chairman & CEO Nimal Gunewardena inducted the festival and introduced the first session on Future Brands. Dr. Ravi Fernando and Yasangi Randeni highlighted the criticality and experiences in embedding sustainability in the company. Researcher Roshani Fernando spoke on the Higher Purpose that brands should embrace beyond its commercial goals. Good Market Co-Founder Dr. Amanda Kiessel spoke on building an economy of brands that are good for people and good to the planet. Selyna Peiris spoke of driving social entrepreneurship to the level of a social movement. Designer Lee Bazalgette spoke of the essential elements of good product design. Virtusa’s Madu Ratnayake spoke of enhancing Customer Experience using the tools of the digital technology. Dr. Rohantha Athukorala spoke on how Sri Lanka could appeal to the New Age Traveller. In the Communications session, Stax MD Kumudu Gunsekara laid the foundation with the Digital Transformation context of today’s businesses and communications. India’s #1 Voice on LinkedIn Prabhakar Mundkur outlined the trends in future brand communications and was followed by Google’s Prashanthan Balakrishnan who showed the way to communicating through today’s Digital ad platforms, while media expert Nalaka Gunawardene elucidated ‘How social media is changing the world of news and views’. PR expert Nimal Gunewardena spoke on the challenges and route to ‘Managing Reputation in the Digital Era’, while Sensei’s Ranjan de Silva revealed how to ‘Engage with Tomorrow’s Audiences’. Kantar Head Himalee Madurasinghe shared lots of statistics on how media is trending into the future. In the final act for the morning, Brandmusiq India’s Rajeev Raja used his flute to enthrall the audience by demonstrating how music could be used for auditory branding with the creation of mogos and soundcapes. The afternoon sessions explored the environmental and social challenges to our collective future. Environmentalist Vidhura Ralapanawe led the charge outlining the challenges of climate change and environmental sustainability. Environmental Architect Sunela Jayawardene followed with ‘Redefining Development’ in this context while a Core Member of the Rainforest Protectors Damith Sudantha spoke passionately on his hands-on Reforestation experiences and Anoka Abeyratne spoke of hers in motivating today’s youth in this cause. The subject of Waste Management was tackled by Chinthaka Abyesekara while Uchita de Zoysa spoke of driving the SDGs through inclusive transformation. Sustainability was back on the agenda with DNV’s Country Head Rathika de Silva speaking on using sustainability to create value for corporates while Carbon Consulting Company Head Sanith de Silva Wijeyeratne showed who mattered in driving it practically through the organization. A look at rectifying socio-political challenges kicked-off with Tilak Dissnayake proposing ‘An Alternative to Governance by Politicians’ while Prof. Rohan Samarajiva scoured the emerging battleground of social media in the context of politics and the nation’s democracy. ONUR’s Mohamed Hisham spoke on their work in forging national unity and reconciliation through communications and grassroots activities. Grassrooted Trust’s Sharanya Sekaram spoke on how men and women could combine in driving gender equality, social inclusivity and respect, while Women Empowered’s Senela Jayasuriya explored empowerment and feminism. Think Equal’s Aritha Wickramasinghe and Hashtag Generation’s Senel Wanniarchchi shared their experiences in getting to children and youth early in their lives to inculcate essential social values and related behaviour. Sevalanka’s Kaushalya spoke on community level interventions to uplift livelihoods and social entrepreneurship to revitalize our heritage industries. The day ended with Guests of Honour former President and ONUR Chairperson Chandrika Bandaranaike Kumaratunga and Minister of Finance and Media Mangala Samaraweera sharing their Vision for Sri Lanka amidst the current challenges and lessons of the past, drawing from their long political experience and sharing various anecdotes that kept the audience enraptured.